Fig. 1. 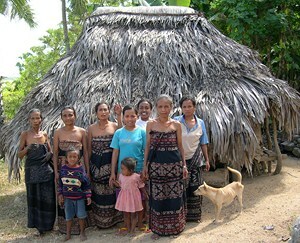 Weavers of wini Ga in front of their tegida, Pedèro, Mesara. The tegida is the meeting place for the members of a wini. It is marked by one or two erythyna trees (dedap, Indonesian, aj’u kare Savunese; Fig. 3) and/or by a small building whose pillars are made out of the same wood. Very few such buildings remain today since Christians usually do not attend such meetings; yet the trees still mark the place of a former tegida. The most important ceremony at the tegida is called bui ihi, (‘to sprinkle the body’), and takes place during one night at full moon in the month Bangaliwu, the last month of the adat calendar. The leader of the tegida gives a blessing to the members of the wini in the name of the founding ancestress of the group. It is the place for asking for help and protection from her. Fig. 2. Rebuilding the tegida of wini Ga in Depe, district of Seba. During the night the heirloom basket of the group is blessed and its content checked; replacement is planned if necessary. Two further ceremonies take place at the tegida: for picking the indigo leaves and making the first indigo dye, and for the first red dye which is obtained from the roots of the morinda tree (mengkudu, Indonesian; kèbo, Savunese). It is the task of male members of the wini to repair or rebuild the tegida (Fig.2). Fig. 3. 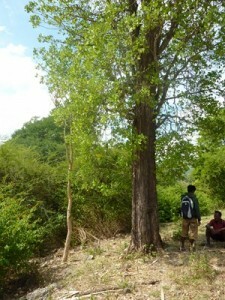 Two erythryna trees may act as tegida for a group of women of the same wini or the same hubi. Tegida Ga Lena (wini Ga), Namata, Seba. In the past the tegida offered the possibility for a woman who married in another village or district to establish contacts with members of the same wini or of the same hubi in her new place of residence. 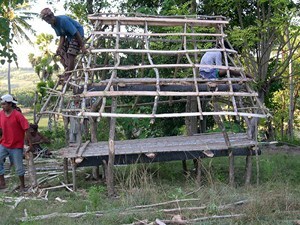 Besides the family network (husband-wife), the udu network (male clan), the tegida offers one more network for the members of the same wini or moiety, a network in the maternal line. This network is on the verge of disappearing.